Today’s feature comes from one of our readers. 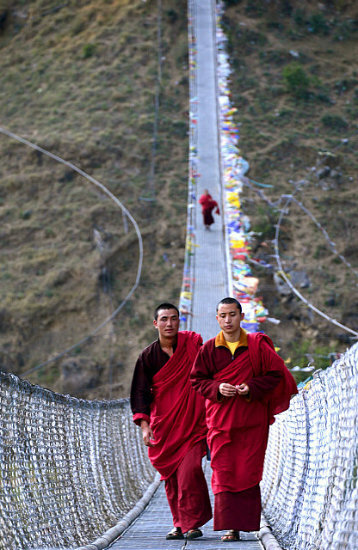 Like many of us here, we share many common threads in our pursuits in life and photography. I wanted to share this work and highly recommend you check out Shobha’s blog and site. Reading the travel stories, images, and breadth of places visited makes a wonderful experience even via the web. It seems so many destinations have become over-visited as of late, or we keep seeing the same travel adventures and photo workshops in people’s portfolios. What really struck me is that this traveler really knows how to pick the spots! It felt fresh. I felt like I was exploring as I browsed through the different sites Shobha has been to. So as usual, links to her sites at the bottom and please leave some feedback, start a conversation, and let me know what you think. If you would like to be featured, or have something really unique to share, feel free to drop me a line. Hey Shobha, thanks for taking the time to share with us today. Travel is a such a common term now a days, especially in photography. I’de love to know why travel photography…what does that mean to you. Your destinations are certainly not your usual family vacation sites, and many are not the first-in-line spots for a lot of photographers. Travel for me is soul food…it fulfills a need that’s deep within me that I can only describe as filling a need in my soul. I grew up at a time when there was no television. What I had was a healthy diet of educational magazines, such as Look and Learn, National Geographic and World of Wonder, and these fired up my imagination as a child. Gradually, the television introduced a whole new world of moving visuals and took me places that piqued my curiosity and expanded my mind even more. Before long I was hooked on ‘National Geographic’ and ‘The Untamed World’, and dreamt of visiting all those far-flung places to which these programs transported me. You mentioned that my images, and my destinations, are not the usual family vacation sites – this is why. 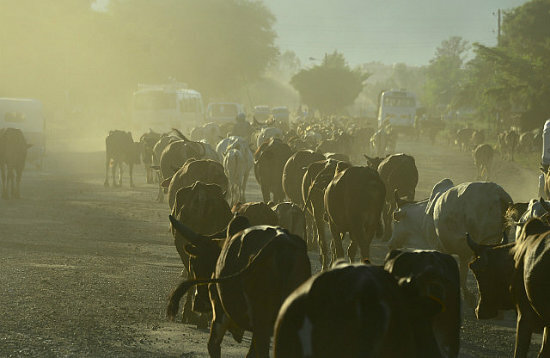 While I appreciate that not everyone would want to venture deep into Ethiopia’s Omo Valley or put up with basic facilities in Western Mongolia, it is only by experiencing it firsthand that you realize the deep connectedness of us humans. There is unity in our differences as there is in our similarities. You can’t read that in a magazine or glean that by watching TV. So while traveling is fun for me and makes me happy, it also challenges me to get out of my comfort zone and do things I would not ordinarily do. It truly awakens my senses and gives me new perspectives. I love how you talk about the connectedness. I feel that is a major point that you touch on. The more we experience diversity in the world, the more the boundaries between us seem to really shrink. So how did a travel blog come about? I started sharing my experiences first through photography and later, a travel blog. I hope my photography opens up an amazing world of diverse places, cultures and landscapes, and I wish for those who view my photographs to be transported, experiencing the moment as I have. The travel blog is a way to share my experiences with my many widely-dispersed family members and friends, and I find myself enjoying the story-telling. Everything comes back to story. So much has gone to video…but I love reading an experience. The illustration allows me to put myself in that place better than a video seems to be able to. I love to read about what went on behind the photo so to speak, or having context that I wouldn’t have necessarily known from just viewing. I know you have been using mirrorless. What are you currently using, and have you seen any benefits from your switch? It was only about 3 years ago that I switched to a mirrorless system. Hiking with a full frame dslr, a backup camera and all the accompanying lenses was taking a huge toll on my neck and back (and I’m quite petite). So I started researching. There’s so much heated debate about dslrs versus mirrorless systems out there. There are pros and cons obviously. In my view, the mirrorless systems have made huge leaps in closing the gap and the debates of late have become less heated. It is a personal decision at the end of the day and I think if you have found a system that you’re happy with and gives you the results you seek, (and doesn’t cause you physical discomfort) – forget the debates and get on with it. It is a personal preference and that’s all that matters. I chose the Olympus system when I made the switch. I liked the look and feel and absolutely loved the range of pro lenses they have. I currently use the OMD EM1 Mark II as my main camera and the OMD EM1 as my secondary camera when I am on a photography expedition. I use a Olympus Pen F for street photography. My favorite lenses are the Olympus 12-40mm, 7-14mm, 40-150mm and the 17mm of the pro series. I think I am getting great results. It definitely beats dealing with neck and back issues! So what is one place you would absolutely love to travel to and photograph? Oh my. This is not an easy one to answer! Where wouldn’t I want to travel to and photograph?! If I had to pick one, it would be the Antarctic … that would be truly amazing! The Antarctic is mine as well. Just magical. Following that up…what is your absolutely favorite travel story. 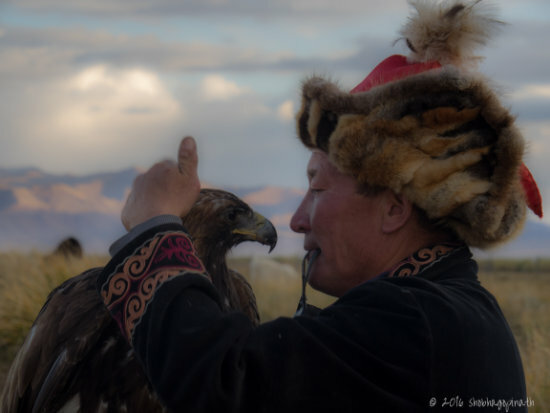 The most unique experience has to have been with the Eagle Hunters of Western Mongolia. We stayed with nomadic eagle-hunters in their ger. There was no running water or shower facilities and it was cold in the mountains – but we got an up-close look into the lives of the eagle-hunters. Hunting with eagles is a 4000-year-old tradition of Central Asia. The female eagle is taken from its nest as a chick (a perilous undertaking to say the least), and is nurtured and trained to hunt small animals like fox and rabbit. The open plains make hunting a challenge and so the eagle does the hunting. The hunters keep the eagles for 7 to 10 years before releasing them back into the wild. This can be a very emotional undertaking as the eagle-hunters believe the spirit of the eagle is intertwined with their own spirit. We witnessed the way an eagle-hunter communicated with his eagle and it was nothing short of extraordinary. Bird and man were bound by an inexplicable link. And so it was quite tragic when the eagle of one of the families we stayed with, flew into electric pylons and died. It felt, truly, like a death in the family. The sadness and poignancy of that time had quite a profound effect on all of us. 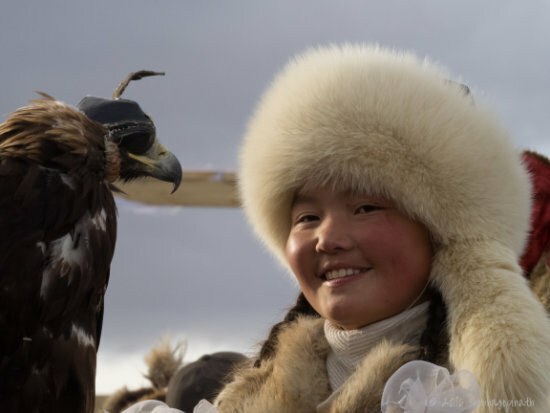 We also got to meet Aisholpan, the teenage girl who broke all cultural and gender barriers to become the first female eagle-hunter when she was only 13! Her story was made into a BBC documentary called ‘The Eagle Huntress’. It’s quite an incredible story, you should watch it. I have actually seen that documentary. I saw it in the theater on a whim without reading what it was about. (I know i’m not the only one that does that!) I am very glad I went that day! It was very inspirational and just an all around touching story. I highly recommend it as well. 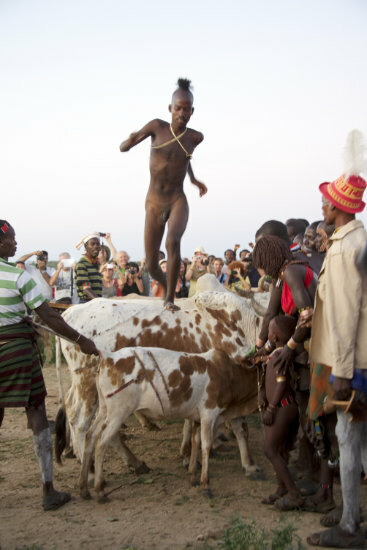 Jumping to another part of the globe…Your Omo Valley images were quite striking. Tell us a little about that experience. The Ethiopian Omo Valley was my most culturally different experience. We visited 5 tribes, each had its unique culture and practice, but the one that was completely astonishing was the Hamer tribe’s practice of whipping women at an initiation ceremony. 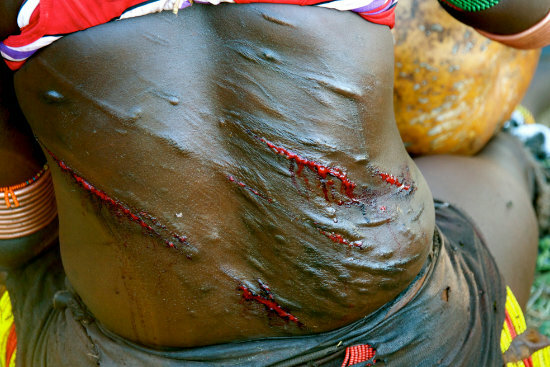 The women willingly subject themselves to the whipping and wear their scars with honour. The whipping is part of a bull jumping ceremony where the young initiate has to jump onto and run over the backs of 4 to 6 bulls held together. He must do this at least 4 times without faltering or falling. On the afternoon of the jump, the man’s female relatives demand to be whipped. They don’t show the pain they must feel and instead scream with apparent joy while they are whipped. The men used thin switches to whip the women. The blood sprayed into the air and oozed from their backs and yet they went back for more. This went on for the whole afternoon – the dancing, the whipping, the singing. They do this to demonstrate their love for the young initiate. In turn, he is obliged to take care of the women of his family and is never to forget the pain they endured for him on this day. For the full story of my trip to the Omy Valley, please click on this link: https://travelblog. shobhagopinath.com/2013/11/27/ vanishing-cultures-of-the-omo- valley/. Is there one piece of advice you can offer that made all the difference for you? Photographic…or not. I think it may have been David Du Chemin who said this “Be open to serendipity”. I love that line, and I continually remind myself to be in that frame of mind. Shooting gorgeous images of exotic locations really speaks to the inner treasure hunter in all of us. How do we get do it? Any advice for travelling, finding places to go, finding what to shoot…any good advice for people wanting to see the world? Well, I think you have to be driven by a passion. It is not everyone’s cup of tea. If you are driven by this desire to see the world, the internet has such a wealth of information that makes planning so much easier. Travel is a lot more affordable now too. It’s finding the time in our busy lives that is a challenge for most people. If you can carve that out then I really do think the rest will fall into place. The more you travel, the more you want to travel. So don’t just think about doing it and do it! So how do we go about discovering more of your work and following your travel stories? 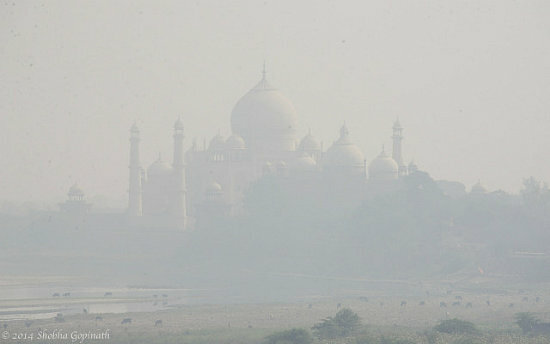 4 responses on "Featured Photographer - The Travels of Shobha Gopinath"
Thank you Glyn! You’re most welcome. Thank you Elizabeth! Photography truly opens up the way you look at the world.